There are some movies you love when you’re a kid that don’t hold up so well when you’re an adult. 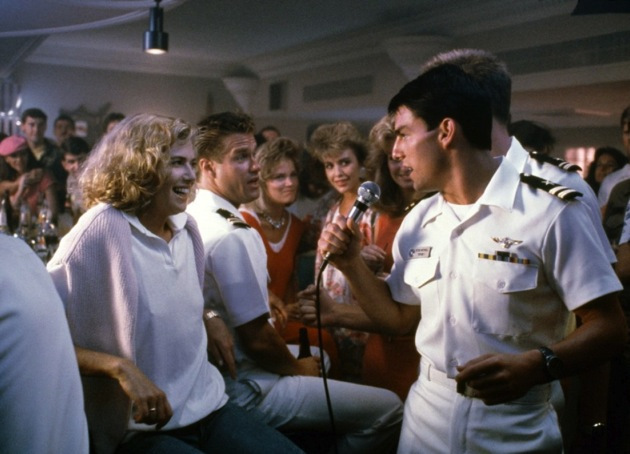 For me, Top Gun is one of those films. I first saw it in theaters in 1986 and I loved it. 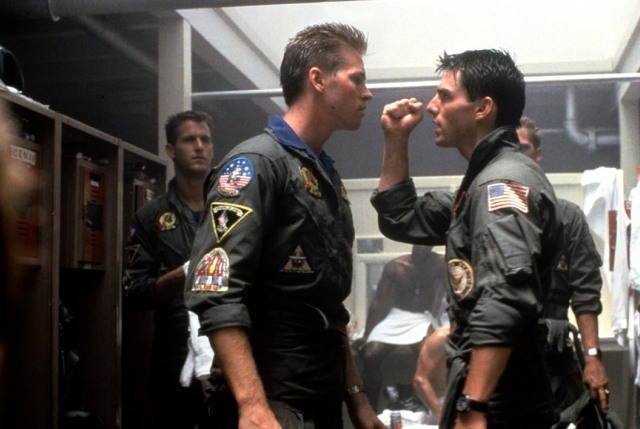 I thought Maverick (Tom Cruise) was cool, the fighter jets exciting, and the dramatic bits emotional. Oh yeah, and I absolutely loved the soundtrack. Revisiting this film so many years later doesn’t quite bring out the same giddy feelings I had as a pre-teen. The good thing is the fighter jet scenes are still pretty cool to watch—especially now, with its new 3D makeover. However, everything else comes off as a bit corny. The love story is filled with melodrama, somehow all the Navy guys don’t seem as cool as they once did, and the son living in his father’s shadow plotline has become a dull cliché (maybe it already was and I just didn’t notice). Back then Tom Cruise was a quickly rising star, but he hadn’t reached his superstar status quite yet. He was likeable in the role, with a winning smile and just enough intensity to pull off the edginess of the character. Pete “Maverick” Mitchell is a top Navy fighter pilot, always second best because of his reckless attitude when flying. He has little regard for rules, which hinders not only his own career but that of his RIO (Radar Intercept Officer) and best friend “Goose” (Anthony Edwards). Despite a few shortcomings the pair is sent off for training at the “Top Gun” school in Miramar, San Diego, California. Why is Maverick so careless in the cockpit? Because he never got over the death of his father, also a top Navy pilot. The official story is that his father, “Duke” Mitchell, was killed in action due to his own error during a mission. Maverick can’t live with the idea that his father made a mistake while flying. The biggest problem with this storyline is where it ends up. They take the easy way out with this one, avoiding any real character growth Maverick could have had. The film does a better job when dealing with a tragic incident that happens during training. That incident is the only source of real emotional impact in the story. What does make Top Gun still enjoyable are the fighter jet scenes and there are plenty of those. With all the training and dogfights, they are up in the air quite a bit, which is a good thing. Yes, it is a little silly that they are engaging an unknown enemy for unknown reasons, but this is not a film about politics. This film is meant to take you on a thrill ride. Anthony Edwards also gives a notably good performance in the film. He brings some comic relief and is also one of the only characters that seems like a real person. Most of the other side characters are over-the-top and one dimensional. However, I also did enjoy Val Kilmer’s performance as Mavericks archrival “Iceman.” Yes, he’s as one-sided as it gets, but he does a good job playing the egotistical jerk who won’t let Maverick forget whose number one. Okay, so not a great film, but still fun to watch. The soundtrack is totally dated, but Kenny Loggins’ “Danger Zone,” still sounds cool when it is paired with the flying scenes. However, I will say it is a bit overused throughout the film. It’s fun to see Tom Cruise in the role that helped push him to superstardom. Eighties nostalgia buffs are likely to still get a kick out of this film. Now there’s extra incentive to revisit it, with a 3D upgrade that is the best this film has ever looked. 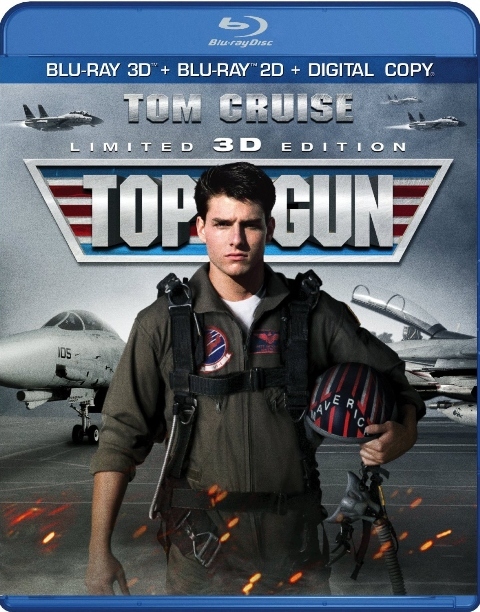 The “Limited 3D Edition” is a two-disc set, with the second disc being the same as the 2008 Blu-ray special edition (right down to the labeling of the disc itself, with ’08 copyright). The brand new transfer for the 3D version is a strong improvement over the already decent ’08 one. The 3D itself is actually very cool, with a true sense of depth added to the battle and training scenes high above the ocean. Sometimes the backgrounds during normal, talking-head conversation scenes look a little bland in terms of 3D-depth, but the action stuff is what we want to see in the new format anyway. The surprise is how much more film-like the new transfer looks, without the excessive noise reduction that was applied to the 2D version. The audio is available in 6.1 DTS-HD Master Audio or 5.1 Dolby TrueHD. Even with the extra channel, these tracks are pretty comparable. They both sound great, but as with the 2D transfer, the audio isn’t an upgrade from the ’08 disc. Again, given that it’s the same disc, the special features are all on the 2D disc and the same as the previous release. That might disappoint those who are taking the double-dip on this one. But if you haven’t seen the two-and-a-half hour documentary (split into six individual segments) which covers every conceivable aspect of the making of the film, you’re in for a treat. There’s also commentary and a whole bunch of older, vintage promotional featurettes and music videos.